Through Guest Service Gold, trainees learn how to anticipate guest needs, deliver memorable experiences, and turn around difficult situations. No time in position is required to earn the certification, giving your clients a marketable edge when applying for their first hospitality job. All three programs are available in English or Spanish, and all lead to the same Certified Guest Service Professional (CGSP) designation upon successful completion of the exam with a score of 70% or higher. Guests remember and share their experiences about your property. Guest Service Gold®: Making Connections provides hospitality professionals with the confidence to engage and connect with guests to find out their needs and provide memorable service. 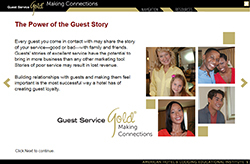 The Guest Service Gold®: Making Connections online program features stories designed to motivate and inspire hotel employees to go for the gold and provide service above and beyond the call of duty. Based on true stories of award-winning guest service, this program focuses on: authenticity, intuition, empathy, delight, delivery, initiative and being a champion. The Guest Service Gold®: Making Connections training prepares employees for the Certified Guest Service Professional (CGSP®) exam. Recognized worldwide, the CGSP® designation is the highest acknowledgement of award-winning guest service for employees in the lodging industry. This individual online training can be completed in two hours. The CGSP® exam consists of 30 multiple-choice questions that must be answered within one hour. Candidates must achieve a minimum score of 70% to earn the CGSP® designation. Golden opportunities are moments and exchanges that, depending on your actions, can leave a guest feeling delighted or disappointed. Guest Service Gold®: Golden Opportunities demonstrates how to provide a level of guest service that leaves a lasting impression on each of your guests, inspires your coworkers, and enhances your job satisfaction. 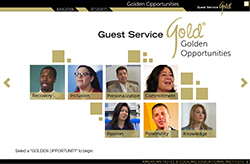 The Guest Service Gold®: Golden Opportunities online program features these seven elements: Recovery: Turn it Around!, Personalization: Provide an Individualized Experience!, Knowledge: Be in the Know!, Passion: Inspire Others!, Commitment: Be All In!, Inclusion: Include Everyone! and Personality: Be Yourself! The Guest Service Gold®: Golden Opportunities training prepares employees for the Certified Guest Service Professional (CGSP®) exam. Recognized worldwide, the CGSP® designation is the highest acknowledgement of award-winning guest service for employees in the lodging industry. Just as one bad apple can spoil the bunch, one negative online review can spoil your business’s chances of attracting new guests. And for tourism destinations, it can be even worse-negative feedback can impact an entire city or region. The reputations of hotels and museums, taxi companies and restaurants, all contribute to a destination’s profile. AHLEI’s best-selling hospitality training program has now been expanded to address the guest service needs of tourism businesses, so all employees can deliver superior service that keeps guests raving about your destination. The Guest Service Gold® Tourism training program includes a DVD that features clips with real-life vignettes illustrating seven key guest service elements: Recovery: Turn It Around, Personalization: Provide an Individualized Experience, Knowledge: Be in the Know, Passion: Inspire Others, Commitment: Be All In, Inclusion: Include Everyone, and Personality: Be Yourself. The DVD segments can be viewed individually to emphasize or strengthen a particular trait, or presented together as a comprehensive program. A trainer’s guide covering the topics, with procedures, discussion questions, and exercises enhances the DVD content and allows for customization to your organization’s policies and procedures. 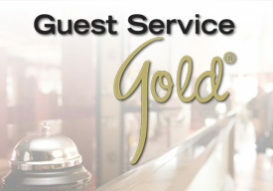 Guest Service Gold® Tourism can be delivered in four hours in a group setting. Once all guest service contact employees pass the Certified Guest Service Professional exam (using either Guest Service Gold® Making Connections or the Guest Service Gold® Golden Opportunities), your property or organization can apply to be recognized as a Certified Guest Service Property or Certified Guest Service Partner. Online training focuses on seven guest service and recovery traits and includes CGSP exam.